Naumes Fruit Gifts is a delicious website that has a huge variety of fruit gifts to choose from. They offer everything from organic fruits to gourmet gifts! My family had the privilege of reviewing the Suncrest Appetizer Gourmet Gift collection. This collection consisted of 9 oz. 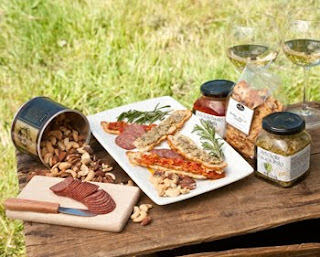 Deluxe Mixed Nuts, 9.9oz Artichoke Piquillo Bruschetta, 10oz Lemon Pesto, 2oz Pre-Sliced Beef Summer Sausage, Cheddar, Chive Currant Focaccia Cracker, Mini Wood Cutting Board & a Small Cheese Knife. The Suncrest Appetizer Gourmet Gift Collection was so yummy! I am not usually a fan of artichoke, but the bruschetta was absolutely devine! We brought out this yummy collection when we had company over for a cookout. We set all of the items out as appetizers, and they were all devoured long before dinner was served! And if the food isn't good enough, just wait to you hear what an amazing company Naumes is: "For every gift purchased through the Naumes’ Donate Fruit™ cause, every purchase will be matched—pound for pound—with an equal donation of fresh fruit to food banks that Feed The Need™. For 1 in 8 American’s hunger is a daily reality. Fresh and nutritious food is a vital component of healthy nutrition. Because needy families often rely on cheaper, processed foods that can lead to obesity and other health problems, Naumes is committed to providing healthy fresh fruit to their tables. To date, the Naumes family has given over 10 million pounds of fresh fruit to Feeding America!" I would highly recommend Naumes Fruit Gifts to anyone! You could order some organic pears for your family, or check out the selection of gourmet gifts. I plan to order a couple of the gourmet gifts as Christmas gifts for family and friends this year too. 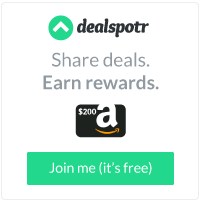 What an easy way to shop for your loved ones, all while giving back to our communities! BUY IT! 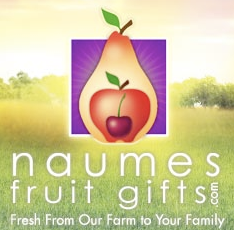 You can purchase your own Naumes products at http://www.naumesfruitgifts.com/ . WIN IT! 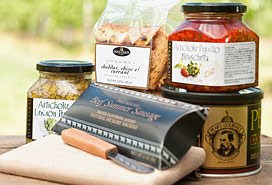 One lucky winner will win the Suncrest Appetizers Gourmet Gift Collection, just like I received! Visit Naumes Fruit Gifts, then come back here and tell me which Gourmet Gift sounds the most appetizing to you! Follow me on Twitter and tweet about this giveaway! (Leave your Twitter name and a link) You can tweet this daily: " Naumes Fruit Gifts giveaway at Opinions of a Moody Mama #giveaway @coopersmommy @naumesfruitgift http://tinyurl.com/28a22po "
I like the All Natural Pear Bath and Body gift set. the giveaway basket looks like it would be my favorite!! The All Natural Pear Bath and Body looks the best to me! I like the Pacific NW Brewed Awakenings. The most apetizing sounding to me would be the Bosc Pear Fruit Box! I would like to get the Brewed Awakenings - Pacific Northwest Coffee Gift Set for my inlaws. I think the rogue gourmet grill and bbq sounds good. The Cranberry and Pear Infusions gift set sounds best to me! The Rogue Gourmet Grill & BBQ is my fave. We love to grill so this looks perfect. I'd love to have the Organic Mix Pear Gift Box. I'm a facebook fan of Naumes Fruit Gifts under username Jennie Tilson. The Comice Pear Fruit Box would be wonderful. Cran berry and Pear infusions sounds awesome. The Rogue Gourmet Grill & BBQ sounds great to me. The Brewed Awakenings Pacific Northwest Coffee Gift Set looks good. I like the organic red pears. Liked Naumes on FB as Judith B. The Foothills tapas sound yummy. Christina - xristya@rock.com - I like the Brewed Awakenings Coffee Gift Set! The GOURMETAPPETIZERS look so good! I Follow Naumes Fruit Gifts on Twitter. My favorite gift box would be the Foothills tapas. I love all the gourmet baskets especially the Foothills Tapas basket. I love the All Natural Pear Bath and Body gift set. The "Perfect Pear" sounds most appetizing to me. The Gourmet Appetizers looks yummy. I would love the The Rogue Gourmet Grill & BBQ, thanks! The Pacific Northwest Brewed Awakenings gift sounds delightful! I would like to try the Gourmet Harvest Sampler. I like the Rogue Gourmet Grill & BBQ. My favorite is the Harvest Sampler Gift Basket. I am a Juno Baby Newsletter Subscriber as jweezie43[at]gmail[dot]com. I am a Juno Baby Newsletter Subscriber as jweezie43[at]gmail[dot]com #2. I am a Juno Baby Newsletter Subscriber as jweezie43[at]gmail[dot]com #3. I am a Juno Baby Newsletter Subscriber as jweezie43[at]gmail[dot]com #4. I am a Juno Baby Newsletter Subscriber as jweezie43[at]gmail[dot]com #5. I am following Naumes via Twitter as jlsc123. I am a fan of Naumes via Facebook as Jill Myrick. voted today via the jk studios giveaway page! The Organic Red and Bartlett Pears look delicioso! Rogue Red Pear Fruit Box sounds internesting. I like the Go Beavs Tailgater. The Foothills Tapas looks like a good enough reason to invite friends over for dinner just to share! They all sound yummy, but I'm going to go with the Pacific NW Brewed Awakenings. Thank you for the lovely giveaway.